On the 15th March 2012 a Royal Norwegian Air Force Lockheed Martin C-130J Super Hercules aircraft crashed into the western face of Kebnekaise (Sweden’s highest mountain) in Lapland, during a military exercise. In addition to five fatalities, the crash deposited some 11000 litres of kerosene jet fuel across the mountain wall, snow and ice, which was then further distributed following a large avalanche triggered by the crash. 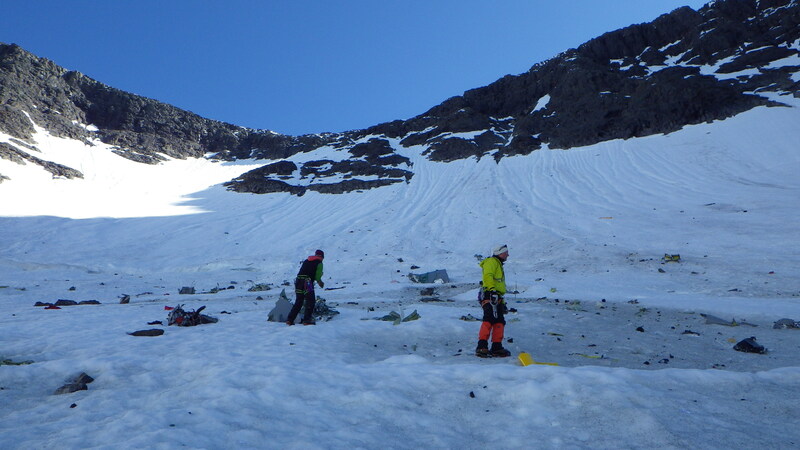 Debris from the crash has been found on Storglaciären, Björlings glaciär, and near the summit of Kebnekaise, but the majority of debris and fuel was deposited on Rabots glaciär, and the pollution was not subject to any immediate decontamination efforts. While much of the aircraft debris has now been removed during clean-up exercises by the Swedish Military (Figure 1), little was known about the fate of the hydrocarbon pollutants. Rabots glaciär is subject to ongoing terminus retreat and thinning, and responds more quickly to climatic changes than neighbouring Storglaciären (Brugger, 2007). Although the Rabots glaciär catchment is in a very remote location, the glacier meltwater outlet (proglacial river) feeds rivers used for drinking water by numerous backpackers and the local Sami, who work with reindeer husbandry along the banks of the Kaitum river system. With a possibility for environmental, social and economic impacts arising from water pollution in this region, it is imperative to evaluate the evolution of the polluted area and mechanisms for hydrocarbon pollutant dispersal from the source zone (Figure 2) in the accumulation area of Rabots glaciär. To tackle this, a monitoring programme has been run by researchers at Tarfala Research Station and Stockholm University (led by Gunhild Rosqvist, myself, and Jerker Jarsjö), including repeat sampling in the snowpack, ice/firn, and the proglacial river for chemical analysis to detect jet fuel components. To investigate the pathways and transit times of pollutants from the source zone (Figure 2), a series of dye tracing tests were conducted as a proxy for flow of pollutants in solution through the glacier system (Clason et al., submitted). In these tests an instrument called a fluorometer detects the emergence of the dye in the proglacial river, following initial injection into flowing water above a moulin (Figure 3), a vertical shaft in the ice which provides entry for meltwater to the internal and subglacial drainage systems. Dye tracing experiments provide an indirect method for understanding what the hydrological system inside and underneath a glacier may look like, how fast and efficiently meltwater flows through a glacier, and the extent to which meltwater is stored during its journey through glacier. Figure 3. 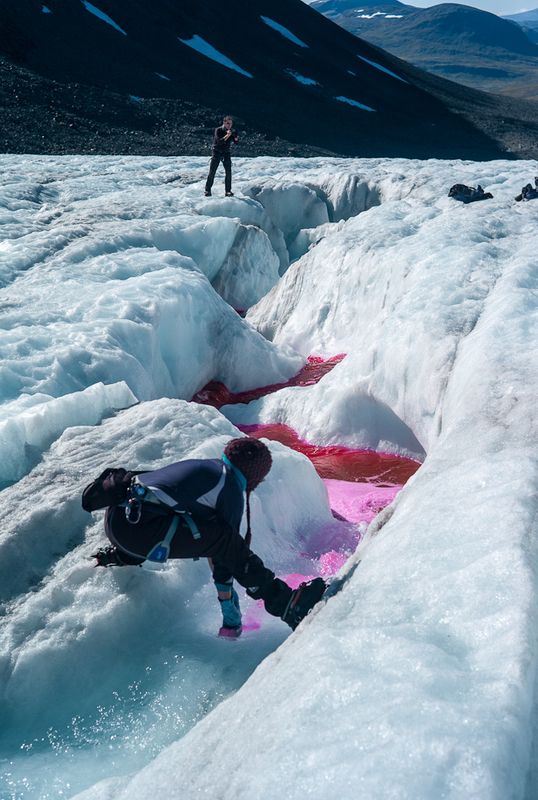 Injection of the water tracing dye rhodamine into a supraglacial stream directly above a moulin on Rabots glaciär. The results of dye tracing revealed likely storage of meltwater and pollutants near the source zone within or beneath the glacier, released in pulses when sufficient water flux from precipitation or melting flushes out the hydrological system. This was supported by infrequent, sporadic detection of pollutants in the proglacier river. The levels of pollutants detected are not thought to currently be a threat to the drinking water supply, but under conditions of higher melting in a warming climate, the frequency and levels of pollution released into the river system could increase. 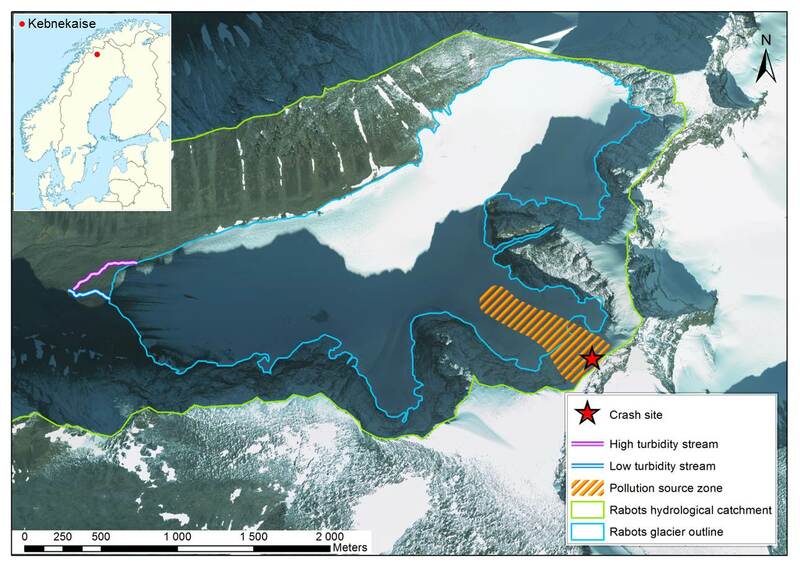 Based on the solubility of the hydrocarbon compounds of the fuel, the lifetime of these compounds in the source zone on Rabots glaciär was modelling with a coupled melt-mass flux modelling approach (Clason et al., in preparation). Assuming no change in summer melting conditions (based on 2013 meteorological data), and perfect contact between the meltwater and the fuel compounds, some of the lighter hydrocarbon compounds have likely already left the glacier. However, heavier components have the potential to persist for tens of thousands of years, far outliving the glacier itself. Under warming climate scenarios we may see increased interaction of these jet fuel compounds with the surrounding pristine Arctic environment, with potential not only to affect drinking water supplies, but also the local ecosystem and even microbial life on the ice. With increasing use of snowmobiles and helicopters in this region, evaluation of both the long and short term impacts of hydrocarbon pollutants must continue. Brugger, K. A., (2007), The non-synchronous response of Rabots Glaciär and Storglaciären, northern Sweden, to recent climate change: a comparative study, Annals of Glaciology, 46, 275-282. A very good, easy to understand summary.